On Sale Now! 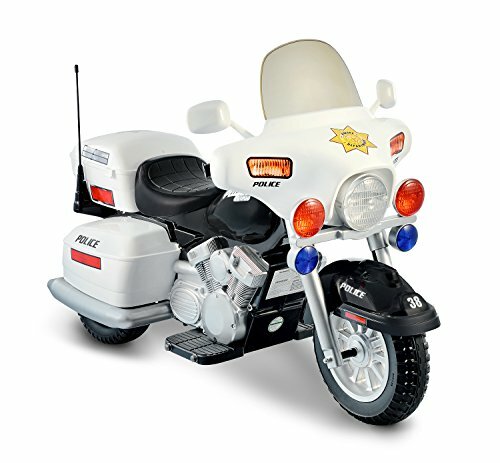 Save 7% on the 12V Police Motorcycle by National Products at Kart Racing Network. MPN: NPL-0958. Hurry! Limited time offer. Offer valid only while supplies last. Little ones will rule the sidewalk with this kid-sized riding toy that can whiz along at up to 5 mph. Forward and reverse motions. Hand accelerator. Little ones will rule the sidewalk with this kid-sized riding toy that can whiz along at up to 5 mph. Forward and reverse motions. Hand accelerator. Headlight, Hazard light & Signal light. Electronic sound. Storage box. Chromed details. Requires one 12V rechargeable battery and charger, included. Adult supervision recommended.